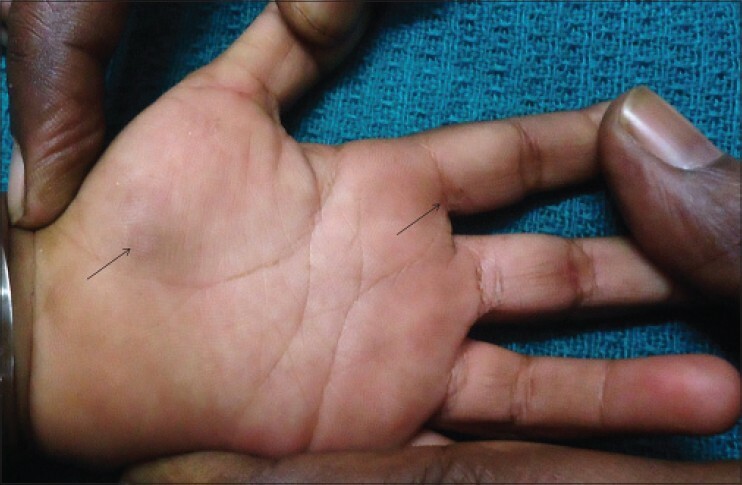 We present a rare case of subcutaneous granuloma annulare (SGA) of the palm in a 3-year-old girl disappearing on removal of a SGA of the dorsum of foot. Though GA is more common in children, subcutaneous type is rare and poses diagnostic difficulty. Very few cases of SGA over the palm have so far been reported. Disappearance of SGA of the palm following removal of a nodule from the foot represents remote reverse Koebner's phenomenon. Granuloma annulare (GA) is a benign, usually self-limiting granulomatous disease of the dermis and subcutaneous tissue. Localized, generalized, perforating, and subcutaneous forms are the common types. The subcutaneous form also known as deep GA or pseudo rheumatoid nodule is commonly seen over the extremities in children. However, palmar lesions pose diagnostic difficulty, especially when the morphology of lesions is different. 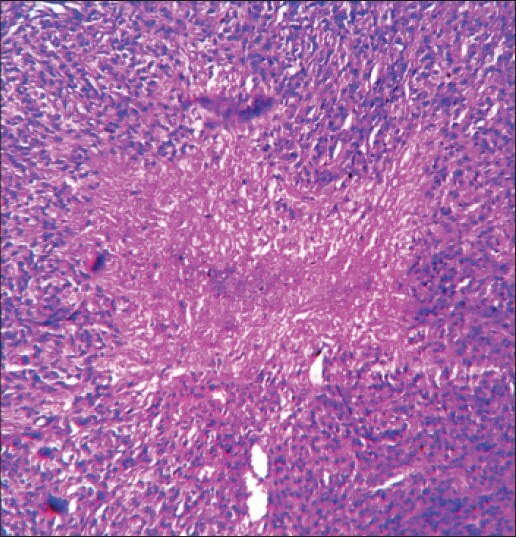 Histological confirmation is required under such circumstances, which shows multiple small foci of palisading granulomas with necrobiosis in the dermis and subcutis. Special stains such as colloidal iron and alcian blue can be used to demonstrate mucin in doubtful cases. Reverse Koebner's phenomenon is unique for GA and not seen in other palisading granulomas. A 3-year-old healthy child presented with asymptomatic rapidly growing nodule over the dorsum of right foot of 40 days duration. There was no history of trauma preceding its onset. On physical examination, she had a skin-colored, painless dome-shaped nodule 3 cm in diameter, over the dorsum of right foot. The skin over the nodule was stretched and there was a thin collarette of hyper keratosis at the base of the nodule. The sole was normal. Examination of the hands revealed a mildly erythematous deep seated nodule, 1.5 cm in diameter near the thenar eminence and a small nodule of 1 cm size over the proximal phalanx of left index finger [Figure 1], which the mother seemed to have noticed 20 days after the appearance of the first lesion and was also asymptomatic. Rest of the skin and mucosae were normal. An excision biopsy was done from the foot nodule which revealed foci of collagen degeneration with palisading lymphohistiocytes in mid and lower dermis extending to the subcutis consistent with SGA [Figure 2]. There were no giant cells. The child's hemogram and blood sugar were normal. On the seventh day after the biopsy, the palmar lesion showed considerable reduction in size and almost resolved in three weeks. However, there was mild residual pigmentation. The nodule over the index finger healed from the center followed by resolution at the periphery [Figure 3]. There was no recurrence during the two-year follow-up period. SGA typically resolves spontaneously, although, most lesions persist for months to years. The annular morphology in the resolving lesion in our case could be due to the destructive potential of the inflammatory cells, probably causing minimal loss of dermal tissue leading to central depression. The pigmentation seen over the palm may be attributed to the post inflammatory response. Pigmentary changes have been reported in GA treated with rifampin, ofloxacin, and minocycline hydrochloride. Treatment is also not indicated even for recurrent lesions. Non-steroidal anti-rheumatics, dapsone, and intralesional injections of triamcinolone have been proposed for those cases resistant to spontaneous healing. Reverse Koebner response is disappearance of the lesions of a particular dermatosis at the site of injury, and commonly seen in GA, psoriasis, vitilgo and vasculitis. Remote reverse Koebner phenomenon was observed in treated cases of vitiligo where spontaneous repigmentation of vitiligo patches occurred distant from the autologous skin graft sites. In our case, palmar nodules cleared spontaneously on removal of the foot lesion probably exhibiting remote reverse Koebner's phenomenon. In children, the lower extremities seem to be involved more frequently. In few reports that are available on SGA of the palm, there was no associated SGA of the foot. Our report seems to be the first pediatric case were SGA of the palm was associated with that of the dorsum foot and palmar lesions resolved within 20 days of removal of the foot nodule. In this case, biopsy was both diagnostic and therapeutic. 1. Takeyama J, Sanada T, Watanabe M, Hatori M, Kunikata N, Aiba S. Subcutaneous granuloma annulare in a child′s palm: A case report. J Hand Surg Am 2006;31:103-6. 2. Mur EC, Fernandez CM, Hermosa JM. 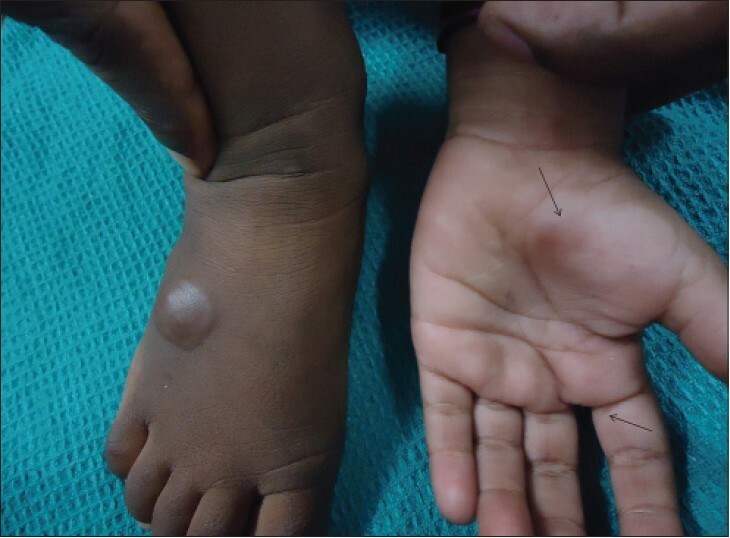 Bilateral and subcutaneous palmar nodules in a 2-year-old child suggesting deep granuloma annulare. J Eur Acad Dermatol Venereol 2005;19:100-3. 3. Hsu S, Lehner AC, Chang JR. Granuloma annulare localized to the palms. J Am Acad Dermatol 1999;41:287-8. 4. Trobs RB, Borte M, Voppmann A, Weidenbach H, Thiele J. Granuloma annulare, nodular type: A subcutaneous pseudo-rheumatoid lesion in children. Eur J Pediatr Surg 1997;7:349-52. 5. Grant I, Mohammed P, Mahaffey PJ. Granuloma annulare in the hand. J Hand Surg 2002;27:556-8. 6. Letts M, Carpenter B, Soucy P, Davidson D. Subcutaneous granuloma annulare of the extremities in children. Can J Surg 2000;43:425-30. 7. Gross E, Rao BN, Pappo AS, Michalkiewicz E, Hudson MM, Kaste SC, et al. Soft tissue sarcoma of the hand in children: Clinical outcome and management. J Pediatr Surg 1997;32:698-702. 8. Smith MD, Downie JB, DiConstanzo D. Granuloma annulare. Int J Dermatol 1997;36:326-33. 9. Fayyazi A, Schweyer S, Eichmeyer B, Herms J, Hemmerlein B, Radzun HJ, et al. Expression of IFN gamma, co-expression of TNF alpha and matrix metallo-proteinases and apoptosis of T lymphocytes and macrophages in granuloma annulare. Arch Dermatol Res 2000;292:384-90. 10. Grogg KL, Nascimento AG. Subcutaneous granuloma annulare in childhood: Clinicopathologic features in 34 cases. Pediatrics 2001;107:E42.